The way hair slowly twirls and fights time. The way the sun rays break through the surface of the water to dance on the skin. 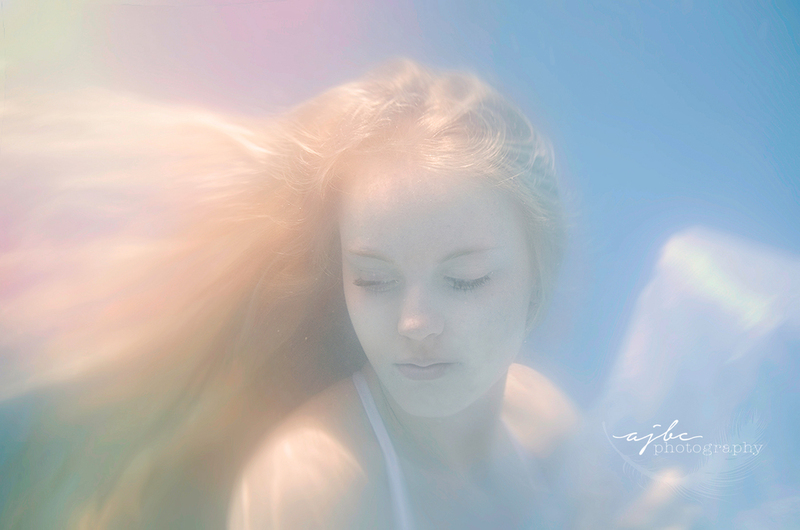 This is the magic that underwater photography brings. Take that visual journey with me. 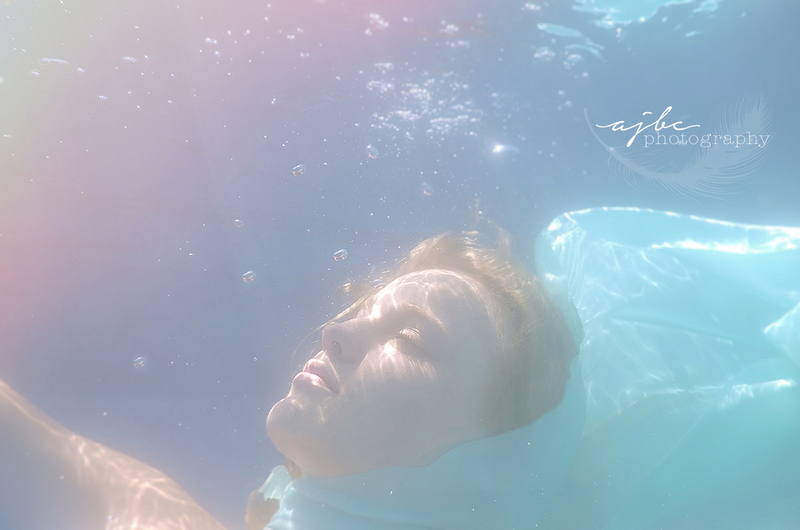 These images reflect the softer side of underwater photography and the absolute beauty I am slowly becoming obsessed with. Part 2 where images transition from color to black and white show a darker side of my experience, something with more grit, something that feels less peaceful and more like a photograph you found hidden in your grandmas attic and wonder- who were those people? I can’t end this story without talking about all the HILARIOUS times we had while trying to accomplish this session. First- it’s a hot, sticky, summer day and I have 15+ yards of fabric for each girl to drape all over herself, almost resembling a horrible 90s prom dress that I PROMISE them will look fabulous once floating in the water- fingers crossed. We pin, pull, and tuck, and then head out to the pool. 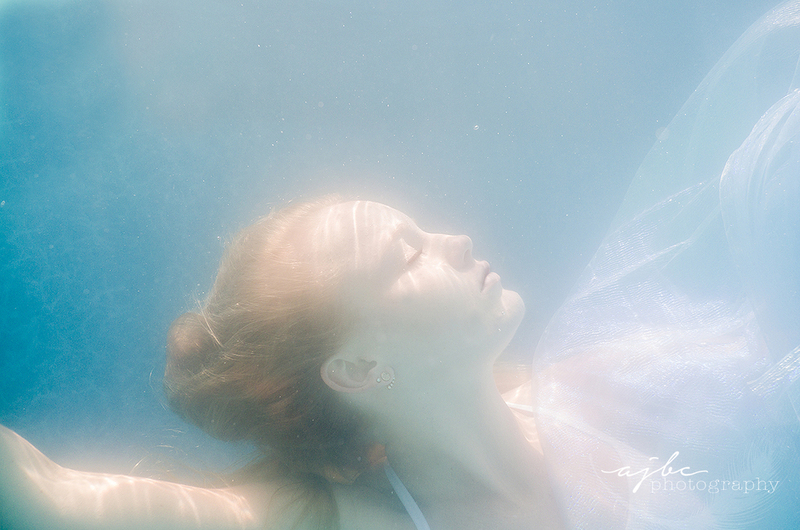 I’ve rented an underwater camera, and despite all the negative things I’ve read about shooting in a pool, I’m confident we’ll still get something beautiful. Instantly... I find out every article I had read was so so so right. The chlorine causes a foggy mess when more than 3 feet away from your subject and what you are left with is either failure, or breaking personal space boundaries. I decided to invade personal space. The girls who were brave enough to trust me with this vision were amazing, amazing models. Not only did they fight with unruly fabric, they also went under water and attempted to keep calm, open their eyes, and vogue in order for me to get the shot. My assistant was in the back keeping the tulle in line, cleaning the pool of beetles and being the moral support I needed when it felt like things were maybe going to be a waste of time. And then just the typical pool things- water in your mouth, water in your nose, chlorine in your eyes. Underwater Photography is a whole new animal. But the whole vibe of the day honestly kept this project together. We had 4 young women all bobbing in a pool together, no makeup, hair a mess, horrible fashion sense, and it felt freeing. So I thank them for that! Watch the BTS video so you can see for yourself! Its hilarious and sums up the day- summer, pool. beauty, lots of laughs.